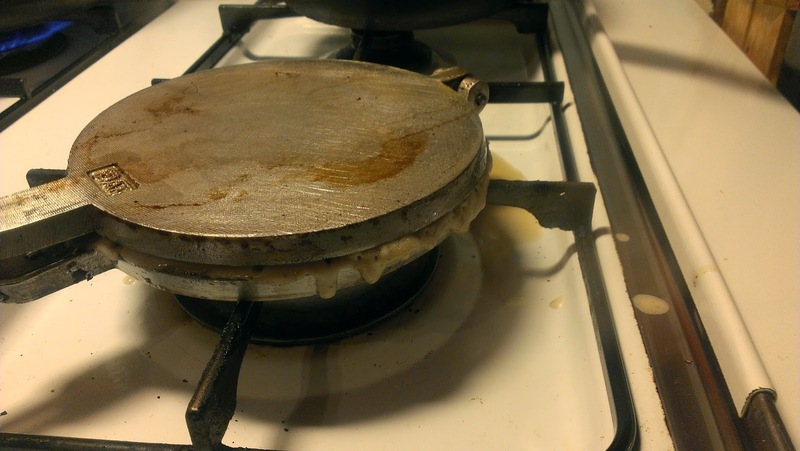 The Sloppy Cook: A brief introduction and a recipe tested and tried! A brief introduction and a recipe tested and tried! I have made this blog with the intention of documenting my participation in the Historical Food Fortnightly, which started just a couple of days ago. If you haven't heard about it - find out more here! I'm a 30-something Swedish female with a life-long interest in history, especially cultural and social aspects of the 17th, 18th and 19th century. My interest in the history of fashion have fore some years manifested itself in historical costuming and I participate in reenactment groups in Sweden. I used to blog about my costuming here, but that blog is more or less defunct for now. 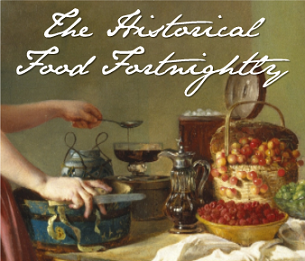 When I heard about the Historical Food Fortnightly, I was very thrilled. I have been curious about historical cooking (mainly 18th and 19th century) for a long time, but haven't really pursued that interest, but hopefully these upcoming challenges will spur me to explore and experiment with recipes, techniques and flavours of the past. 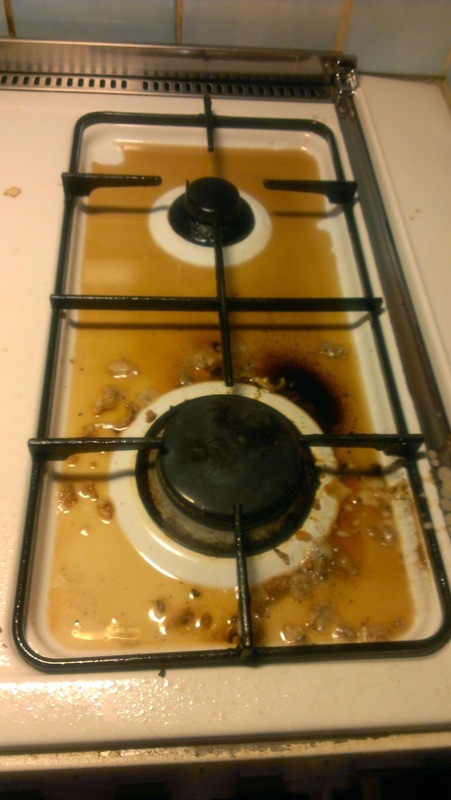 That said, I have to admit that I'm not a very good cook even by modern standards, so I don't expect to become a very accomplished historical cook by any means. I have close to zero practical experience when it comes to food history and my only tools for now is an average, modern kitchen, for better or worse. But my main goals are to have fun, hopefully learn and amuse readers of this blog and other participants in the challenge, and I think that will do for a rather good start. I guess you could translate this to "thin wafers" and that's exactly what it is. I don't have a date for this recipe, but I would wager late 18th century or early 19th century. It's from a scanned pdf version of a Swedish 1786 cookbook I've had for ages, but only last week I realised that there were lots of handwritten recipes in the very back of the book. How wonderful! When, and by whom, these recipes were written we'll never know, but fortunately that's not necessary for trying them out. After that, intuition and common sense had to be employed! 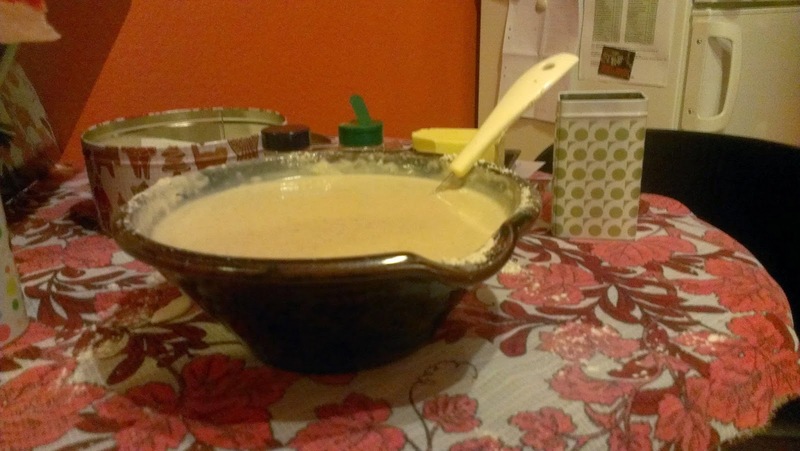 The recipe instructed to add sugar "to taste", then flour until the mixture slightly stuck to the whisk. Lastly some cinnamon and cardamom. I really should have taken note of how much sugar and flour I used, but I completely lost track. I added the flour little by little until I thought the batter was not too runny, not too thick.The finished batter was something akin to pancake batter and slightly sweet but not overly so. I was generous with seasoning but I can't say how much I used. This is the finished batter. It was. A. Lot. of batter. 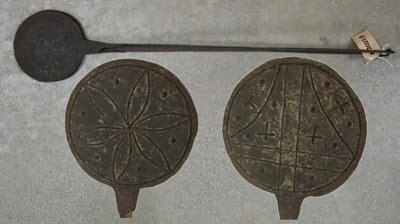 Wafer iron, undated. Vänersborgs Museum via Digitalt Museum. but from what I can gather, the first kind was used for tunnrån ("thin wafers") and the latter for gorån. Gorån may have been a thicker variety, I don't know since I haven't seen an example in person, but I think they're still popular in Norway for instance. 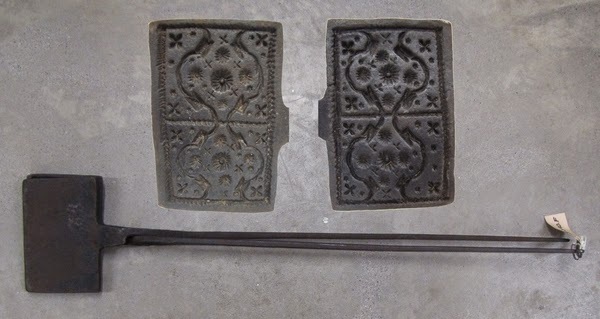 I have to research more later on (I took a look in a Swedish mid-18th c. cookbook* and for some recipes the author called for a tunnrån iron, and for others a gorån iron, so there was apparently an important difference but I'll leave it at that for now). I own a tunnrån iron myself, albeit of a rather modern kind. 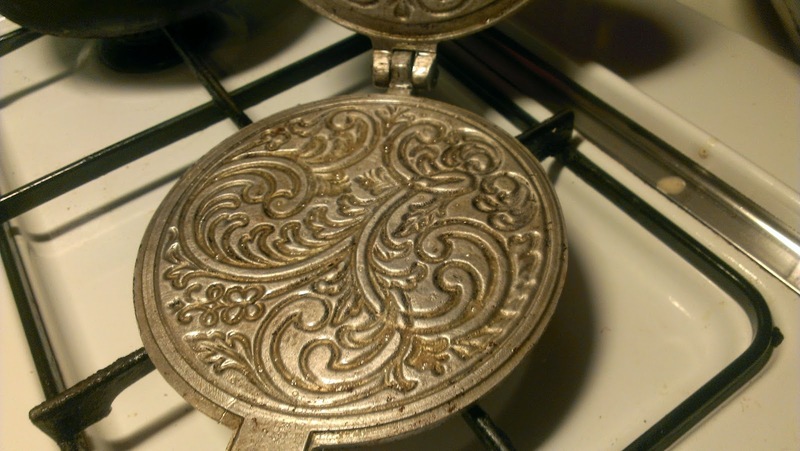 I'm not sure about the material, but it's obviously not cast iron like the examples above. Still very pretty, no? I had only used it once before, so i was a little nervous. Last time I tried it I had OK-ish results considering being a total beginner, but that time I used a modern recipe that several other persons had vouched for. Now, I was completely on my own! The iron is greased with some butter in the picture above, though it might be hard to see. I re-greased the iron between each and every wafer. 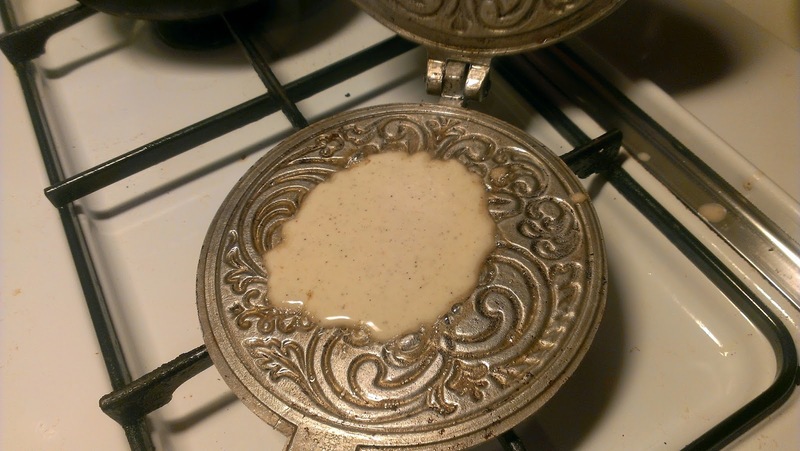 I don't know if it's necessary but I didn't want to risk having to scrape burnt batter from every little crease, the mere thought was painful... I used approximately a teaspoon of butter, for the whole iron, each time. Another difficulty I remembered from my first experiment was that you had to fidget around until you found the optimal combination of heat vs time, i.e. 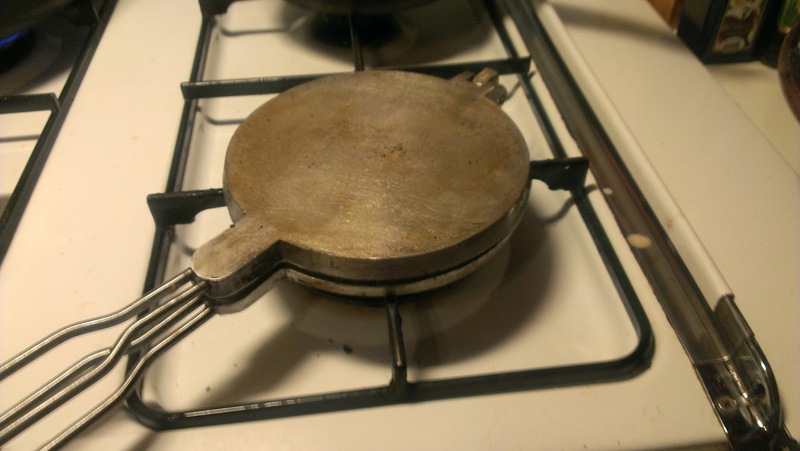 when to flip the iron over and when to remove the baked and hopefully finished wafer. If the iron is too hot, it is of course easy to burn the wafer, but if it's too cold or if you remove the wafer to early, the pretty pattern won't be very noticeable on the wafer. Tricky! ...which of course was way too much! Look at that mess. I kept using the ½ deciliter measure but only filled it up a little more than halfway which worked OK. 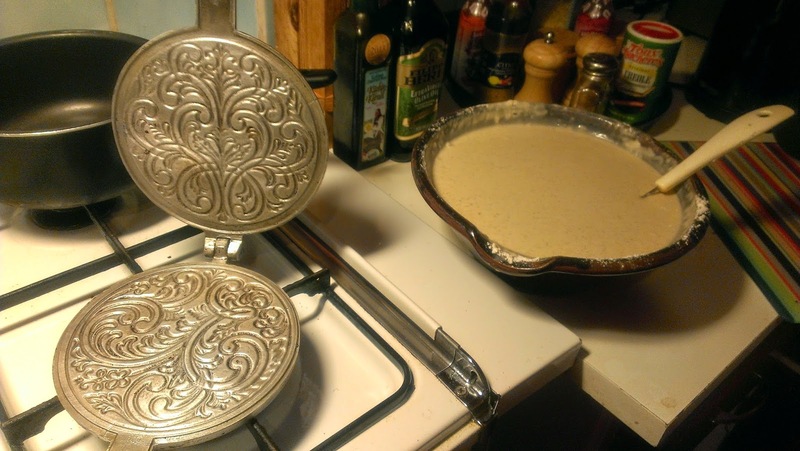 But more importantly, the batter seemed to behave very nicely right from the beginning! 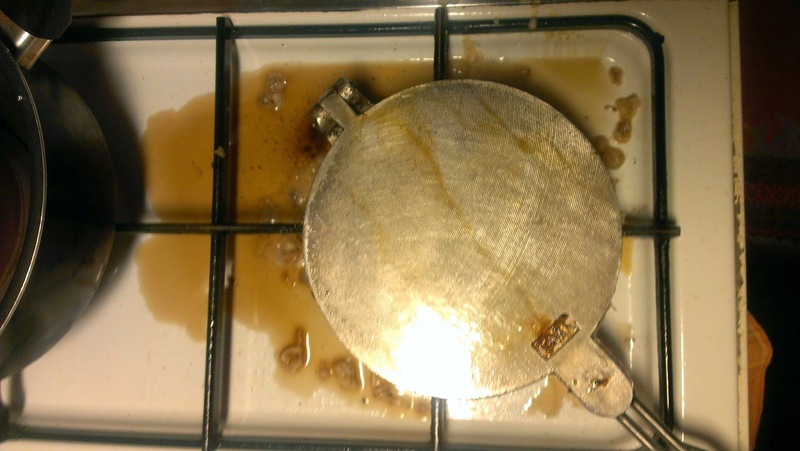 It didn't stick, the wafer seemed to harden quickly after being removed from the iron and the flavour was nice. Hooray! These kind of wafers aren't too common nowadays, but not completely forgotten either, and those who make them usually roll them up on the iron while they're still hot and pliable (because they harden very quickly once removed). 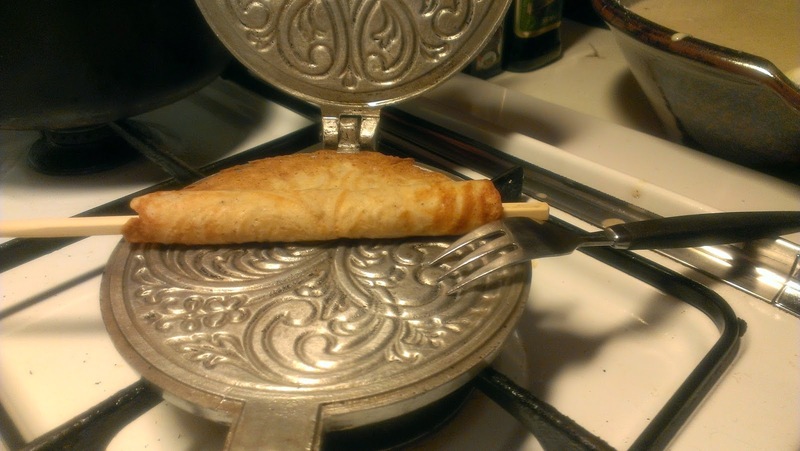 You can use a special little tool for this, but I don't have a such and use a chopstick and a fork instead. 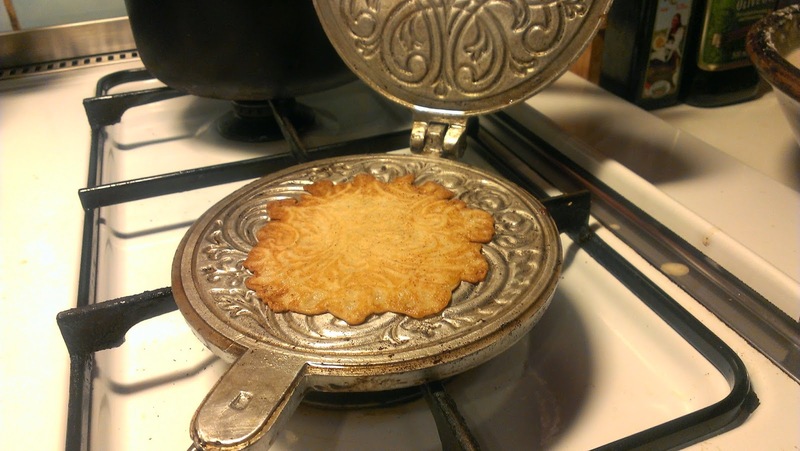 I don't have any evidence for shaping the wafers in this way in the 18th & 19th century. The mid 18th c. cookbook I mentioned above does give some directions for shaping the wafers, but not to what size and by what means (or rather: i don't know how to interpret the instructions!). It may have been like this, or not. I would like to research that more as well. You don´t have to do anything at all either, but rolling them up like this makes them easier to store and somewhat less likely to break (they're quite fragile). You can shape them into bowls or cones, like ice cream cones, as well. They're quite fun to make - but messy! ...because this is what it looked like in the end! It does seem fitting to the name of this blog and the image in the header though! ...58 wafers! Most of them turned out OK, but I really haven't perfected the technique by any means yet. Those in the front got too dark and I got rid of most of them, but that still leaves me with 45-50 wafers. I don't know how well they keep and for how long: The recipe instructed to keep them between two plates/dishes with paper under and above - and lemon peel... I decided to put them in cookie tins with paper towels between each layer, but without lemon peel (simply because I didn't have any lemons). I wonder if the lemon peel was meant for additional flavour or some other reason? I'm going on an event on Friday so I will bring as many wafers as possible and force them upon people! But - how good were they? Well, I can only compare them to the ones I made before, from a modern recipe, but I would say that they compared very, very well. The texture was very nice and crispy once the wafers cooled off, but I think that the modern variety had a slightly better crispiness and were slightly lighter since they had a bit of potato starch in them in addition to the flour. The flavour was nice, although I could have used a little stronger hint of the cinnamon and cardamom, though I thought I was very generous with both (maybe they had spent too long time in the spice rack - I should be more ambitious and use whole spices freshly beaten next time...). I used some lemon zest when I made the modern version and I missed that touch a bit - but the recipe did call for lemon peel for when storing the wafers, so I may have missed out by omitting that step. But overall, I'd say that this was a very good recipe that worked very well in a modern setting without any adaptations. The only drawback may have been that the full recipe makes for a huge batch - half of it would have suited me better, but that's easy to fix next time. Link to Pdf version. The recipe can be found on page 57. * See Cajsa Warg, Hjelpreda I Hushållningen För Unga Fruentimber pages 689-690. Unfortunately, no online version exists. Yum! Those look delicious! I'm from Minnesota and there are a lot of people here with Scandinavian ancestry (self included - I have a Norwegian great-grandfather), so I'm very interested. These look a lot like krumkake. Hi! 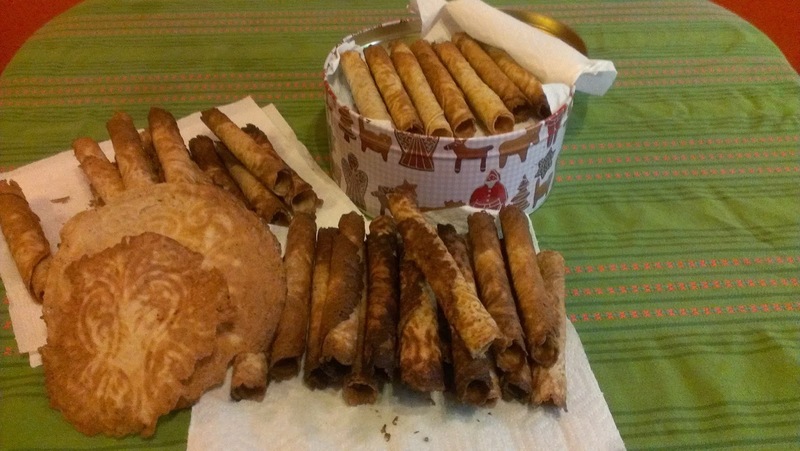 I googled "krumkake" and I think they are extremely similar except that the krumkaker are cone shaped. I have some very, very distant relatives i Minnesota still. Several cousins of my great grandmother emigrated in the late 1900s and i have been able to keep track of a few of them! I have a few recipes from a "Swedish-American" cookbook from the 1880s that was designed for Swedish emigrants. I look forward to trying one of them for this challenge!